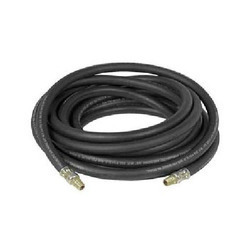 Our product range includes a wide range of heavy duty high pressure hose. We supply Heavy duty Industrial Hose pipe for compressed air, water, fuel, Sand & Other Applications. MOC : Spl.P.U, Nylon, Spl. Rubber, S.S.
End fittings: Male / female thread/ or Spl. as per requirement. Length: 1 Mtr to 100 Mtrs. Delivery: 3-6 Days from Confirm Order. Additional Feature: Auto reverse ( Retractable ) Hose Reel is also available for Compresed air welding Cable, garden Pipe, Auto service center, Farm , Bunglow, Assembly Shop , Fire safety line, etc.